With Valentine’s day approach we’re looking for love-themed cards over at The Male Room. I pulled out the Simon Says Stamp January card kit for my creation, and in fact did three different takes on the same design. You can see all three in the video below, or read about the other two in my next blog post which will be out a few hours after this one. If you want to make a love-themed masculine card we’d love to see you link it up in our challenge. Also be sure to check out our Instagram page as we’re having a giveaway, and we’d love it if you’d join us on Facebook too! 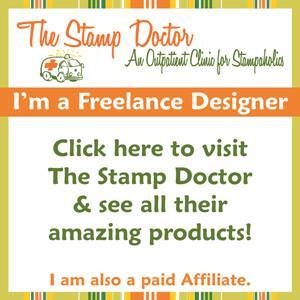 I began my card by choosing the patterned papers I wanted to use for it. I went through the various papers from the Echo Park Celebrate Winter 6×6 Patterned Paper Pack and first chose the neutral paper with the snowflakes. I knew I wanted the card to have a snowy theme, and it seemed a good choice. The dark blue strip actually came from the extra piece on a sheet that was otherwise cut-aparts – the strip has a hole in the middle which is for hanging the paper pad, but I knew I’d be able to hid that behind my focal element. I still wanted one other paper though, and decided on the stripes as it incorporated the same neutral and blue colours as my other papers, but also bought in a little more interest with the addition of some red. Having chosen all the papers I trimmed them down and set them to one side. Next I worked on my focal element – the snowman. I chose the front-facing snowman from Simon Says Stamp’s Snow Much stamp set and stamped it onto some Neenah Solar White 80lb card stock, which is alcohol marker friendly. I used my go-to MFT Black Licorice Hybrid ink for the stamping. I then coloured the snowman using my Spectrum Noir Illustrator markers. I made use of my swatch sheet to help me match the colours to the colours in the patterned papers. I incorporated the blues for the scarf and the band of the earmuffs, added the pop of red for the earmuffs themselves, the mittens, and part of the jumper (or sweater, if you prefer), and then used more neutral shades for the rest of the image. I also added a touch of shading to the snowman’s body with a cold minty blue, and orange for the carrot nose. Once I had finished all my colouring I carefully fussy-cut the image out. Usually I fussy cut right along the stamped lines, but with the delicate nature of the snowman’s arms I decided that wasn’t the best approach. Instead I cut the image in a way that would leave a slight white border all the way around. This also meant that I did not need to bring in a marker to go around the edges after cutting. The last thing to do was to add my sentiment. 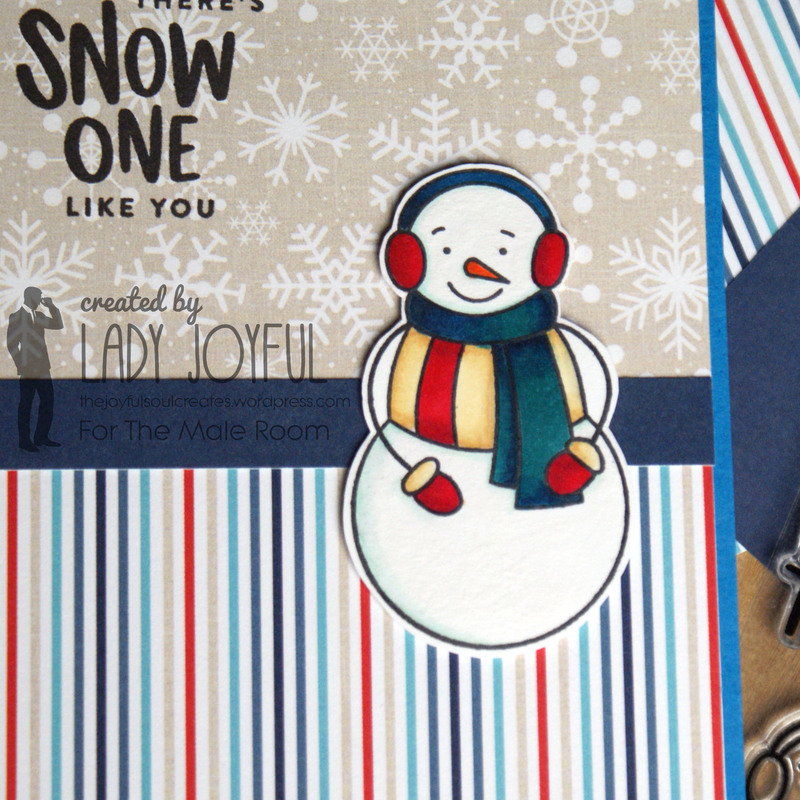 I chose one from Simon Says Stamp’s Snow Much that I felt was appropriate both for the challenge theme and the elements of the card. Once I had stamped that onto my neutral paper panel I began assembling the card. I created a card base from Simon Says Stamp Island Blue card stock then adhered my top and bottom panels with double-sided tape. I added the blue strip over the divide between the two, again with double-sided tape, and then used foam tape to pop up my snowman, making sure it hid the hole in the blue strip. Finally I used a Tonic Nuvo Aqua Shimmer pen to add a touch of sparkle to the snowy parts of the snowman. I’m really pleased with how this card came together. Whilst I don’t use patterned papers a lot usually, I love how well papers in these packs coordinate with eachother, and how easy they make it to create a great design. I’m pleased too with how well the colouring of the snowman ties in with the patterned paper colours. The sketch I used for this card is really fun, and you may recognise it from this card too. If you watched the video, do let me know which of the three cards you like best (I think this is my favourite), and remember you can check out the other blog post to read more about how I made the other two. A fabulous masculine card, Charlotte ! Love how you coloured the snowman’s scarf with the same colours as the patterned paper stripes below. Beautiful design and great sentiment too. Thanks so much for sharing and for playing along at Uniko. Oh my gosh! How darling! Love the clean and classy design with the punchy bits of color you added. Just too cute! Your snowman makes me smile! Absolutely delightful! Thrilled that you shared your creativity in the Uniko gallery! I just can’t say, which one I like more! This male styled one or the feminine snowlady! Lovely project. Thanks for sharing with us at Crafty Hazelnut’s Patterned Paper Challenge. Hope to see you again.